Many aspects of stargazing make it seem like we live in a clockwork universe: the positions of the planets, solar and lunar eclipses, and even the changing of constellations can all be mapped out over millennia. But then there are the inconstant events such as stray meteors and auroras that can occur seemingly without warning. Because auroras occur after Earth-directed explosions on the Sun, they can be predicted, although not very far in advance, and even then sometimes they fail to produce. Solar wind can reach Earth's atmosphere in a variety of ways. Besides the always-flowing stream of solar wind, larger inrushes can occur after a solar flare or coronal mass ejection. The solar wind pushes high energy particles to collide with ions of oxygen and nitrogen in Earth's atmosphere, transferring energy and "exciting" them. When the excited ions relax, they emit energy in the form of light. Because the currents of charged particles travel along the magnetic field lines, they travel toward both poles, resulting in the aurora borealis (northern lights) and aurora australis (southern lights). The solar cycle, which runs from higher activity to lower activity and back again, is approximately 11 years long. Previous solar maximums were during 1980, 1990, and 2001. 2012 should be another solar maximum, and an increase in auroras has already been witnessed, along with an active Sun. Besides the year, the time of year can also be a factor, although scientists aren't exactly sure why. 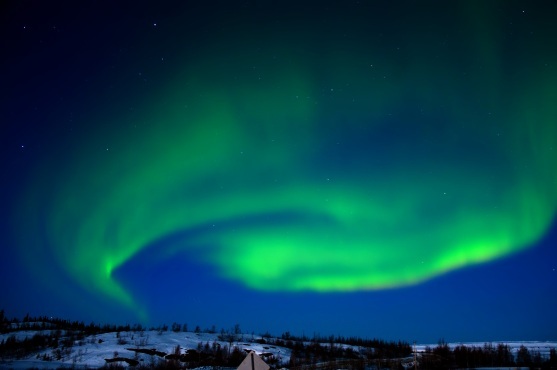 Spring, especially the months of March and April, and autumn, most notably September and October, tend to have more auroras than other times of year. The closer you are to the auroral oval, the better your chances at seeing the lights. There is not a lot of land close to the southern oval, but in the north, some of the more likely spots to view the aurora borealis are from Alaska, Canada, Russia, Iceland, and Scandinavia. Summer is not the best time to take a trip to these locations if your sole goal is to see the lights, because the longer hours of daylight limit the possibility of seeing them. Fortunately, large displays occasionally occur that can be seen in southerly locations such as Arizona and Italy. Pictures of the northern lights are often stunningly gorgeous, with electric blue whorls or curtains of red. And while the aurora can look like this, for most of us, we will be lucky to see a faint greenish or bluish glow on the northern horizon. 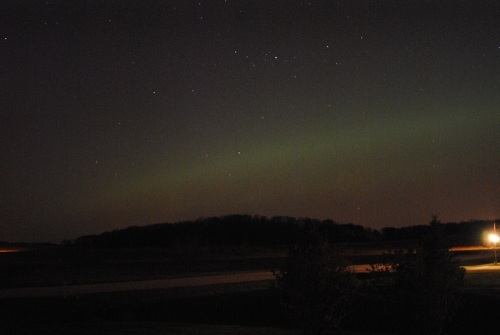 The glow seems to surge higher and then fade a bit and can easily be confused with light pollution. To maximize your chances for a good view when the aurora is occurring, head away from city lights and neighboring house lights and find a quiet country lane with unobstructed views to the north. Websites such as spaceweather.com regularly track the Sun's activity, giving sky watchers hints as to when the next aurora might occur. NOAA's POES web site will give you current conditions as to how strong the aurora is on an hourly basis and if the oval is widening and extending southward. You can also follow different accounts on Twitter such as @Aurora_Alerts or the author @Astronomommy to find out if anything is predicted or happening now.